Figure 20.41 The capacitor in a defibrillation unit drives a current through the heart of a patient. b) The patient would get burned by the increased power. This is College Physics Answers with Shaun Dychko. 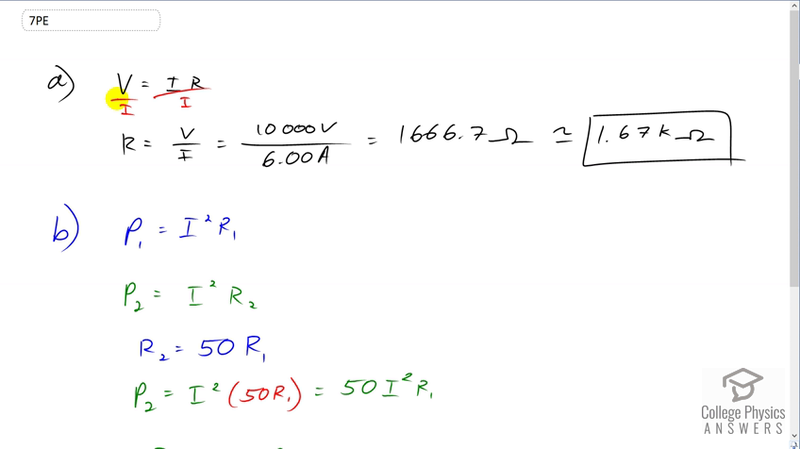 Ohm's Law says that voltage equals current times resistance and we can solve for R by dividing both sides by the current and then switching the sides around. So the resistance of the person's chest is the voltage divided by the current. That's 10,000 volts divided by 6 amps which is 1.67 kilo-ohms. Now, we're asked what would happen if the conducting gel was not used and so there was a compensatingly higher voltage to get past that higher resistance in order to give the same current because it's apparently the current that is important for jump-starting the heart. So we have two power outputs to consider. In the first case we have the conducting gel in which case there is a resistance of R one. This current does not get a subscript one because we're told that the current in these two cases is meant to be the same. So in scenario two, the power output will be the same current squared but multiplied by a different resistance R two. We're told that R two is about 50 times R one. So the current without the conducting gel is about 50 times greater than the current that does has conducting gel. So we'll substitute 50 R one in place of R two in our formula for P two. That makes 50 times I squared R one. I squared R one is P oneand so we can say that P two is 50 times P one. In this case, this power is going to result in the patient getting burned because power is the amount of energy that's output per second. You know watts is joules per second and watts is the units of power. This energy is going to go in the patient's skin and burn it. So that's why you want a conducting gel.